The 89th installment of the Pikes Peak International Hill Climb opens this weekend, which means that now seems like an appropriate time to provide a preview of what is arguably the world’s most famous hill climbing competition. Represented by drivers and racers from ten different countries - France, Italy, Japan, Spain, New Zealand, Sweden, Mexico, Australia, Great Britain and the USA - the 2011 Pikes Peak International Hill Climb will feature 194 different racers, all of which are looking to win their respective classes and break some records in the process. The festivities start on June 24th in downtown Colorado with the Fan Fest, a free event that is expected to gather about 35,000 fans from 5:00-10:00 pm. As part of the festivities, fans will get the chance to see all the participants with their racers, as well as enjoy live music, motorcycle jumps, the Denver Broncos cheerleaders, and, of course, a chili cook-off. Even Hollywood star and car aficionado, Paul Walker, will be on-hand for the event as he was tapped to be the driver of the Porsche 911 Pace Car. Riding shotgun beside Walker for the ceremonial lap will be Colorado Springs, Mayor Steve Bach. 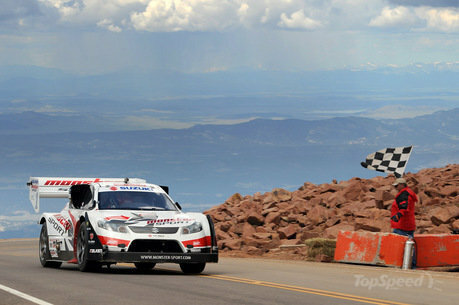 Check out our preview of the 2011 Pikes Peak International Hill Climb after the jump. 2011 Pikes Peak International Hill Climb Preview originally appeared on topspeed.com on Thursday, 23 June 2011 20:00 EST.